Those taking their holidays here will find limitless opportunities for exploring off the beaten track, and for searching out tranquil villages and hidden beauty spots along roads that emerge above the clouds one minute and plunge into a deep gorge the next. Walking routes abound through the variegated woodland where one can see so much flora and fauna in the undisturbed places. Within 3 km there is the Lac de Lastioulles noted for its nautical sailing school and water sports and Lac Crégut noted for its trout fishing. 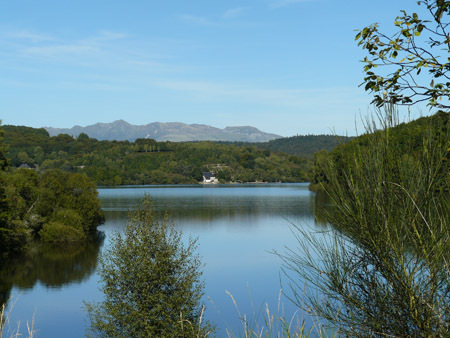 Lac de Lastioulles is the ideal place to relax and unwind during the summer months, the water is ideal for swimming and the banks are a great place to enjoy a picnic with the stunning mountain backdrop. Throughout the region can be found the 'AOC Routes Des Fromages', the cheese roads, where one can discover the farms, which make and sell the renowned cheeses, St. Nectaire, Cantal, Forme d’Ambert and other unknown gourmet delights. Markets abound selling their home produce including cheese, honey, sausages and salamis, vegetables and much much more can be found each day in one of our local towns. Click here to see a listing of markets in the Auvergne. The Massif Central is not the first place that you think of when you talk about skiing in France. However, the Auvergne offers a dramatic landscape with ancient volcanic features and pristine snowscapes. The Auvergne hosts ski resorts at Besse / Super Besse, Le Lioran, Le Mont Dore and Les Estables. Within 25 km of our B & B is the ski resort of Super Besse. It is a modern resort with 24 pistes (altitude 1350m - 1830m) and is connected to Le Mont Dore which offers a further 85 km of pistes. Super Besse is fully equipped with 22 ski lifts, snow sports area, tubbing run and a discovery area which is floodlit between 5-9pm every Saturday and during school holidays. It has 200 snowmaker machines, night skiing and the all important sledging area with permanent snow coverage. As well as the Alpine skiing, Super Besse is an ideal resort for snow shoeing, dog sledding and Nordic skiing, with over 120 km of cross country slopes. Situated close to the medieval town of Besse, it is a great way to combine skiing with sight seeing and shopping. At the foot of Le Puy de Sancy, which is the highest peak in the Massif Central at 1886m, is Le Mont Dore. The ski resort here boasts 33 pistes, 20 ski lifts and 81 snow machines. Around Le Mont Dore and Super Besse you can try a host of new and exhilarating snow sports. These include ice climbing, ski touring on the Sancy Ridge, kite skiing, quad biking on snow and ski joring - being pulled along by a horse on skis. The Auvergne has a lot to offer for winter sports and at a much cheaper price than other main ski resorts in France.